Nice weather and a nice onshore breeze for three days running now. The breeze is a nice change from the close to still days and a little breeze is always welcome offshore for comfort and it often kicks up the catch rate a bit. Sunscreen ans a hat are good additions to your carry on items for a trip offshore, and don’t forget your sunglasses, it can be quite bright on many days. We continue to focus on the reef and it’s edges in waters roughly from 90 to 150 in depth. A south current has brought us some very clean and clear water in those depths and catches have been for the most part good. Clear clean water can at times affect the number of bites as it becomes a little more difficult to fool the fish into taking a bait as they become wary. Add a flat calm sea and they can become even more hesitant, so we are happy to have that breeze blowing with these clean clear water conditions. The blue water is beautiful, but slightly cloudy water is very often best when targeting fish along the reefs. So the fishing has been generally good with exception of an occasional tough bite day. 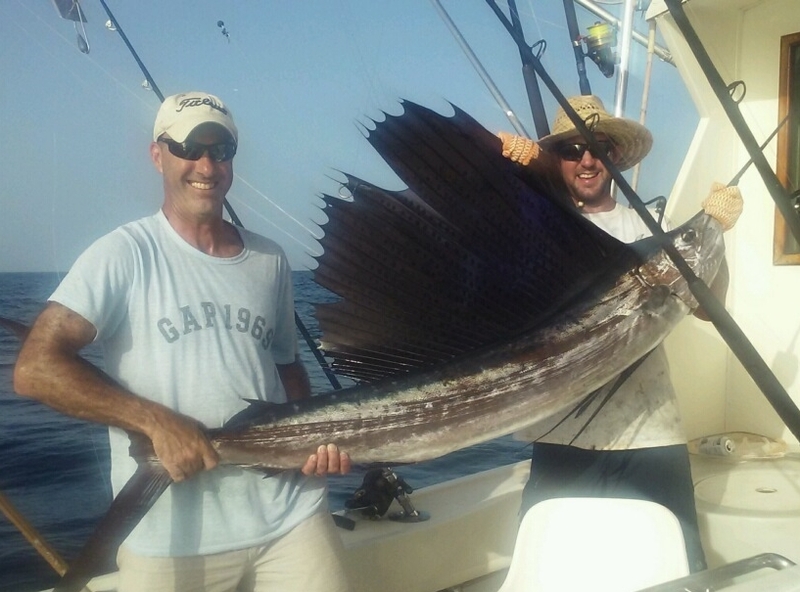 Fishing along those reef edges has produced Sailfish for our anglers on two of the last three charters. Good sized fish this time of year and always nice to see one on the end of the line. 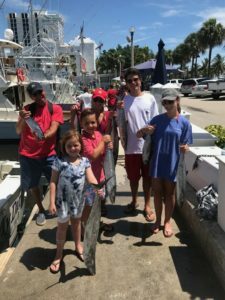 August is not high Sailfish season for the Fort Lauderdale fishing area but there are always some around and not a total surprise. 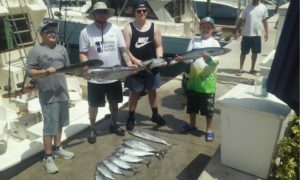 Some nice school and slightly larger sized Kingfish have been biting. 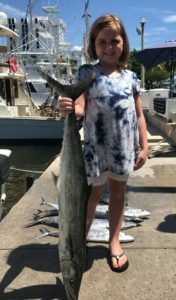 The Bonito have often been fierce, fun to catch and a big hit with the kids, but they take time ( and the baits aimed for Kings) to land and when their numbers are up the Kingfish numbers often go down. Not that the Kings are fewer (August is a strong month for them) they just get out hustled by the aggressive Bonito. An occasional Blackfin here as well. Mahi-Mahi scattered as usual as it has been this summer with a strong showing followed by a slow one.